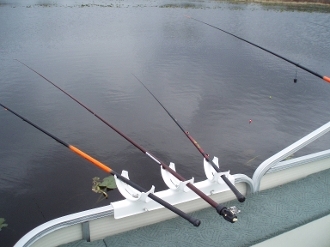 The Triple Bay Box Fishing Rod Holder was designed to fit over the square or rectangular railings found generally on pontoon boats. Each Triple Bay Box Fishing Rod Holder provides three rod holder bays that are adjustable by tilting and by swiveling. They will hold rods of all types and sizes. They are perfect for still fishing or for trolling. Form molded out of high-density polyethylene (HDPE), they can withstand temperatures ranging from -148 degrees up to 230 degrees. They are harder, stronger, and safer than PVC and resists stains from solvents and chemicals. Our fishing rod holders are assembled with non-corrosive stainless steel hardware making them ideal for both freshwater and saltwater use. We also use black T-knobs to tighten the rod holders in place, which are easier to turn than wing nuts and more attractive. All of our fishing rod holders come with a limited lifetime warranty. This means that the product will be free from defects in materials and workmanship for the lifetime of the product to the original end user.